Our Clinton, Arkansas church recently purchased new hymnals to replace the ones we had worn out over several decades. Why did we do this, when many other congregations are transitioning to praise and worship music? Does it matter whether we use hymnals or not—at home or at church? I believe it does. I believe well-chosen, Biblically-sound hymns have much to offer, as Dr. Ashton clearly describes. I believe our hymns have made me a stronger Seventh-day Adventist Christian. Why do I still sing hymns? First, I was raised on hymns, and the habit stuck (Proverbs 22:6). Second, I want the Word of God to dwell in me “richly” (Colossians 3:16); hymns are saturated with Scriptural quotes and teachings. Third, I want to be “filled with the Spirit,” (Ephesians 5:18), God's Spirit, and I believe hymns facilitate that. Fourth, I have tested hymns in all the vicissitudes of my life (1 Thessalonians 5:19-21), and I believe hymns offer solid food for growing Christians (2 Timothy 3:16-17). They assist in the formation of a Christlike character. Grab your Bible, and I will explain. “Train up a child in the way he should go, and when he is old, he will not depart from it” (Proverbs 22:6). Mom must have claimed this promise over my musical training and experimenting. I was raised with a rich and varied diet of sacred music, including hymns. Our family sang together during family worships; I sang alto. Mom gave me piano lessons, omitting all jazz and boogie theory and assigning me hymns and classical music. Then she enlisted my fingers for daily song service at church school, then for Cradle Roll, then finally for church. She cued me from the organ. We played many piano-organ duets. Dad often led song service and sang solos. I played for him, too. If not, we shared a hymnal in the pew. Once, I was sent to play for a tiny, outlying church. I had a solid foundation in wholesome church music. To supplement this, we sang out of some gospel books at home; at school, a favorite teacher played guitar and taught us many catchy motion songs and a few Scripture songs. At camp I learned many more, and I brought the best ones back home to share. This trend continued through my academy years, until I had sampled and acquired many types of “Christian” music. As I crooned and played my new favorites, Mom occasionally cautioned me; but I knew better. I had found a musical buffet, and I was refilling my plate. I veered back and forth from the sublime to the “drivel,” as Mom described the especially trite tunes. My soaring teenage emotions allowed spiritual highs like I never had with hymns, yet my devotional life remained the same—sporadic and lifeless. I never realized that the lyrics and music styles I now enjoyed were eroding true spirituality. My first college vespers featured a special number I knew from one of my favorite tapes. Yes! I stayed for afterglow, and learned the camp songs popular in the Southern states. I'll even admit to singing “I just wanna' be a sheep, baa, baa-baa, baa...I don't wanna' be a hypocrite, cuz' they're not hip with it...” with enthusiasm. I was now so open-minded my brains were falling out! I added country music to my musical plate. It seemed so right, as I was in Tennessee. During a college religion class, a favorite professor challenged us: “You can't give God your heart while the devil's got your head.” Oh, really? My best friend and I were mutually convicted that he was right. We pledged to give up fingernail polish (a hassle, anyway) and worldly music. A few tapes got tossed and a few more afterglows filled the void...for a while. In God's providence, my roommate's small country church needed a pianist, so I kept playing hymns (God bless small country churches!). “Let the word of Christ dwell in you richly in all wisdom; teaching and admonishing one another in psalms and hymns and spiritual songs, singing with grace in your hearts to the Lord” (Colossians 3:16). Some years later, I went to Weimar College to study massage therapy for a year. There I heard hymns and sacred songs sung with Spirit-filled enthusiasm. Why not? There is “power in the blood.” I joined choir, bell choir, band. I played for special numbers, for vespers and for hymn sings around the piano. The light began to dawn: The spiritual highs I formerly enjoyed were only transient deceptions. My Weimar experience now led me to desire “the sincere milk of the word” (1 Peter 2:2) and to rethink my music values. Weimar's music was well-chosen, appealing to my mind and my emotions. Besides hymns and sacred songs, I learned many more Scripture songs. At the Weimar Library book sale, one small paperback caught my eye. It had a 1970s cover, nature scenes inside, and it described how to write praise songs. The basic formula called for a mantra phrase coupled with lots of hypnotic repetition, resulting in easy memory and a blissful, trance-like experience. I discarded the book in disgust. Is that what I had sung with such gusto? “And be not drunk with wine, wherein is excess; but be filled with the Spirit; Speaking to yourselves in psalms and hymns and spiritual songs, singing and making melody in your heart to the Lord” (Ephesians 5:18-19). In my innocence and exuberance, I imbibed some “wine” of false doctrine. I swallowed the charismatic notion that God's Holy Spirit was in evidence when my music was sensually appealing, emotional, hyper-rhythmic. I later learned the history of my beloved beat-dominated, mantra-immersed, emotionally-based, lyrically-vague and biblically-challenged music. Search “music” on Audioverse.org and you will hear how Satan, fallen master musician, has used it to usurp our worship. “We have also a more sure word of prophecy; whereunto ye do well that ye take heed, as unto a light that shineth in a dark place, until the day dawn, and the day star arise in your hearts: Knowing this first, that no prophecy of the scripture is of any private interpretation. For the prophecy came not in old time by the will of man: but holy men of God spake as they were moved by the Holy Ghost” (2 Peter 1:19-21.). Now I see! Scripture is “more sure” than my personal opinions and feelings. The Holy Spirit which gave it helps us discern spiritual things properly (1 Corinthians 2:14). Truly “spiritual” songs should align with Scripture, not just appeal to my flesh. As Eve “saw that the tree was good for food, and that it was pleasant to the eyes,” (Genesis 3:6), I chose musical “food” based on its sensory appeal. Since Eve's sensory evaluation led her to forfeit Paradise, should I risk using her strategy? 1) Does this music add to or detract from my godly training? 2) Does my favorite music increase my desire to study and obey God's Word? 3) Which spirit is my “spiritual” music filled with, the Holy Ghost who inspired Scripture, or the rebellious, sensual spirit of Satan, the arch-deceiver? “Quench not the Spirit. Despise not prophesyings. Prove all things; hold fast to that which is good” (1 Thessalonians 5:19-21). Here's the fourth reason I still sing hymns: I have tested and proven them. 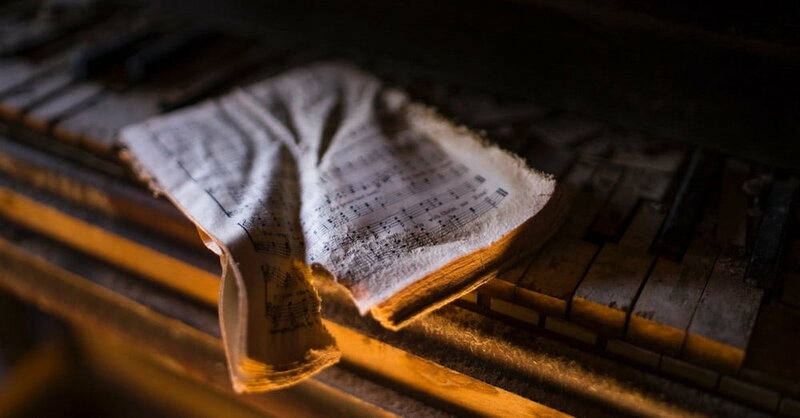 Like Scripture, well-selected hymns are profitable “for doctrine, for reproof, for correction, for instruction in righteousness: That the man of God may be perfect, thoroughly furnished unto all good works” (2 Timothy 3:16,17). One day I decided to sing through my small car hymnal while driving to and from work. It fit on my steering wheel, and I could glance down as needed (on quiet, country roads). God used that daily hymn time to refine true spirituality in me. The profound simplicity of these Christ-centered, musical poems convicted me to tears almost daily, then re-tuned my thoughts, my feelings. Self shrank: “Not I, but Christ be honored, loved exalted...” Comfort came: “I will never, never leave thee...” Priorities changed: “I'm but a stranger here, heaven is my home.” Prophecy prompted: “Look for the waymarks, as you journey on...” In my hymnal, as in my Bible, I found “meat in due season” (Psalm 145:15) on every page. I have noticed, while collecting hymnals and gospel songbooks, and playing for several Sunday-keeping churches, that our SDA hymnals are special. Fanny Crosby's hymns are precious, and they are in many hymnals. But F.E. Belden, et al, wrote many hymns for Seventh-day Adventists—artistically embedding the third angel's message—and they deserve to be sung, too. Our hymnals omit the tunes with jarring, difficult rhythms. Our hymn meters are marked and easy to follow. The less artistic camp-meeting songs of bygone days are de-emphasized. Yes, I like some praise songs; yes, I like certain “Christian” albums. But are they worthy of my time and attention? In probation's last hours, I believe God would raise my standards ever higher. “Higher than the highest human thought can reach is God's ideal for His children,” Education, page 18. “See then that ye walk circumspectly, not as fools, but as wise, Redeeming the time, because the days are evil. Wherefore be ye not unwise, but understanding what the will of the Lord is” (Ephesians 5:15-17). These verses precede the injunction to be “filled with the Spirit,” verse 18. Since forfeiting his position as heavenly choirmaster (The Story of Redemption, page 25), Satan works tirelessly to compromise music. He is still “more subtil,” as in Eden long ago (Genesis 3:1). Here is another musical test: Flip randomly through a favorite “Christian” songbook and an SDA hymnal (Use the oldest version you have.) and compare the depth and quality of music and lyrics. For each flip, compare the two songs and ask a few questions: Which of these two songs has more doctrine, more overt Scripture quotes and allusions? Which one faithfully reproves? Which corrects, then instructs in righteousness (2 Timothy 3:16,17)? Keep flipping until you can declare a clear winner. As I test my music collection, God nudges me to refine it. Truly, there is “a time to keep, and a time to cast away” (Ecclesiastes 3:6), because the songs we sing feed our thoughts and inspire our actions. The best ones require thorough mastication and meditation to be appreciated; so does the Bible. Even outside Adventism, God's people testify that hymns are well-constructed and worthy of use: (source). I have collected many hymnals and Christian songbooks over the years. Someday I hope to compile my favorites into a book. One treasured hymnal of mine is this 1888 edition of The Seventh-day Adventist Hymn and Tune Book. These are precious and powerful! (source). Holly Joers is a lifelong SDA who was raised in Southern California and now is blessed to live in rural Arkansas with her husband Skip and son Elijah. She is a church pianist and is addicted to Bible study, gardening and bargain-hunting, among other things.